We operate from 29 Cabra Road Hillsborough (5 minutes from Sprucefield Shopping Centre on M1). 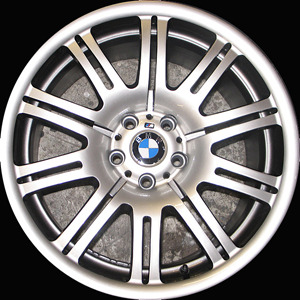 There are two different processes we offer at Alloy Wheel Fix, you can either opt for a front face refurbishment or a full strip and refurbishment. 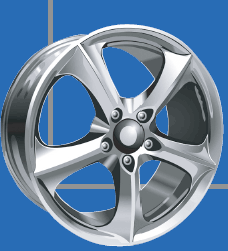 A front face refurbishment involves removing the tyres, then lathing any kerb damage out of the wheels, they are then lightly aluminium oxide blasted to give them a key. Any remaining damage is then hand sanded out of face of the alloy, the backs are throughly cleaned and any old wheel weight tape is removed. A coat of primer is applied to the wheels, this is then hand sanded to a perfectly smooth finish, then given two coats of solvent based paint (in whatever colour you select). Finally a top coat of 2 pack fast drying lacquer is applied to the wheels, two even coats are applied to ensure a strong smooth finish. The tyres can be fitted within an hour of the lacquer being applied. The main difference between this process and the full strip is the original paint finish is painted over, rather than removed. We can complete this process within a day, with you dropping the car or wheels up to us either the night before, or at 9am that day, you can expect your car back at roughly 6pm. A full strip and refurbishment involves removing the tyres, then lathing any kerb damage out of the wheels, the wheels then have all the old weights removed and are placed into our wheel stripping acid. When the wheels are removed 45 minutes later, they are then aluminium oxide blasted to remove any residual corrosion. This will not damage the rim in any way. Then two coats of primer are applied to the wheels, which is then hand sanded to a perfectly smooth finish, two coats of solvent based paint follow (in whatever colour you select). 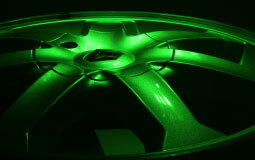 We weld cracked wheels and they are ready the day after you drop them down to us. 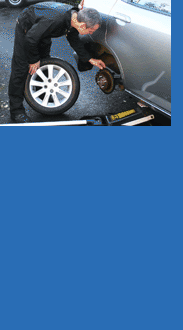 We straighten wheels and can straighten them within a few hours, while you wait service available upon request.